I spoke with my contact at Snowbear and he told me that the kit you actually want is the part # SB324-120 which is the correct adapter for your older SnowBear plow and will allow it to connect to a 2 inch front hitch. I reached out to my tech contact at Snowbear and he was able to confirm based on the dimensions you gave that the Retrofit Kit for SnowBear Winter Wolf Snowplows - 2 Point Hitch Mount # SB324-120 is indeed what you need. This will turn your 2 point bracket mount plow into a single point compatible with your front mounted receiver. If you have a SnowBear plow then the correct control box for your application is part # SB263-285 on our site. 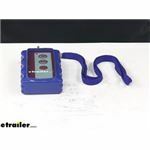 This is the direct replacement and will work with what you already have so you don't have to worry about compatibility as long as you have the Single Speed Electric Winch # SB263-282. This also means that the Replacement Switch # SB263-848 will work for you ! In order to use a Snowbear plow on the front of a 2004 Jeep Grand Cherokee Laredo you'll need to use the one that installs with a front hitch. So for the front hitch you'd need the part # C31048 and then for the plow you'd want the part # SB324-081. If your SnowBear snow plow is a model that fits in vehicle-specific mounting brackets and it is missing the cross member you would need to add # SB324-060 to go from the plow to the mounting brackets. Which plow do you have? I can bring up the parts list and you can see if you are missing anything such as the cross member. In the picture you sent I do not see the above-mentioned cross member. I checked with SnowBear and the correct bracket kit for a 2013 Jeep Wrangler Unlimited Rubicon with 4-wheel drive and the standard factory bumper is the Custom Mounting Bracket Kit # SB397-101. This kit is designed to fit SnowBear Hydraulic or Winter Wolf snow plows though if you let me know the model number of your plow I can check with SnowBear for compatibility. You will not need the 5XM5 Universal Cross Member # SB324-060 to mount your Winter Wolf plow if you are using the Custom Mounting Bracket Kit # SB397-010. The cross member # SB324-060 comes with the Winter Wolf plows. So if you misplaced that piece or bought the plow used and it didn't include it then yes, you will need to add that cross member as well. We do carry the Snowbear Hydraulic Plow part # SB324-116 that you are looking for. This is an 84 inch wide and 22 inch tall plow that uses their 2 point attachment system. The Custom Mounting Bracket Kit for SnowBear Hydraulic and Winter Wolf Snowplows # SB397-101 is not a fit for your 2003 TJ. The kit you will need is the Custom Mounting Bracket Kit # SB397-010. This is a confirmed fit. You may also be interested in the 5XM5 Universal Cross Member for SnowBear Snowplows - Qty 1 # SB324-060 and the Drop Extension with up to 6" Drop # SB324-128 if you have a lifted TJ. While my contact at SnowBear was not able to get me the dimensions you asked about they were able to tell me that the Replacement Scraper Blade # SB324-066 that you referenced is designed to fit the older and newer models of their plows so they guaranteed it will work for you. SnowBear plows either install to a vehicle with mounting brackets or a front hitch. Since it sounds like your plow uses brackets the correct kit for your 2006 Jeep Wrangler would be the part # SB397-010. If you needed a hitch though the correct hitch would be the # C31028 instead. I did some checking and replacement mount # SB324-120 is not listed as a fit for the SnowBear Personal line of plows. Instead you will need # SB324-138 for a SnowBear 82 inch Personal plow. I do have plow options for you but I spoke with my contact over at Snow Bear and they have not yet confirmed a custom snow plow mount kit for the 2017 GMC Sierra 1500 (March 1, 2017). What you can do is use a plow that attaches to a front mount trailer, # C31069, which does fit your truck. With the front mount hitch installed you could then use Snow Bear plow # SB324-082, # SB324-172, # SB324-081, # SB324-080, # SB324-168, or # SB324-140. I attached a picture that shows the install instructions for the Caster Kit for SnowBear Snowplows # SB324-126 that you referenced. The correct SnowBear plow mounting kit that fits a 2003 Ford F-250 is the part # SB397-017. Since you said you have the older style plow with the receiver cups the correct replacement cross member is the part # SB324-136. I spoke with my contact at Snowbear and he told me that the kit you actually want is the part # SB324-120 which is the correct adapter for your older SnowBear plow and will allow it to connect to a 2 inch front hitch. Your dimensions listed match what this is designed to fit as well. The distance between the two dowels on the SnowBear 5Xm5 Universal Cross Member # SB324-060 is approximately 32-3/4 inches. The diameter of the dowels themselves is 1-5/8 inches and they are just about 4 inches in height. This cross member is designed for SnowBear Plows and will install between the 2-point vehicle specific mounting brackets and the snow plow itself. For just the control box on your SnowBear Winch, you will want # SB263-285. I reached out to my contact at SnowBear to confirm this is the part you want. The part that you are looking for is the Retrofit Kit for SnowBear Winter Wolf Snowplows # SB324-120 that you referenced. I spoke with my contact at SnowBear who said that the pin measurements are the same and that they measure about 32-5/8" apart on center. If you measured just the distance between them and found that to be 29-3/4" then that would explain the difference there. The # SB324-138 is the correct replacement 2 inch shank for the SnowBear Proshovel part # SB324-172 that you have. Thank you very much for your question, I just double checked with the manufacturer that assembles the SnowBear Salt Spreader # SB324-223 and they confirmed that the salt spreader is not designed to work with sand. The helix is designed for larger media. This will work with most types of de-icing agent such as dry-bagged rock salt or ice melt. The Custom Mounting Bracket Kit for SnowBear Hydraulic and Winter Wolf Snowplows # SB397-105 is the bracket kit you want. This bracket kit is confirmed to fit your 2014 Ford F-150 4x4. 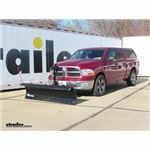 This is compatible with the SnowBear Winter Wolf Snowplow 84" Wide x 22" Tall # SB324-167 or 82" Wide x 19" Tall # SB324-166. Actually SnowBear does not list a max height range for their snow plows like the part # SB324-082 that you referenced. It should work just fine on both your Jeep and your Ford F250 as long as you have a 2 inch front hitch mounted on both. I recommend for your application the Retrofit Kit for SnowBear Winter Wolf Snowplows - 2 Point Hitch Mount # SB324-120 enables you to use your 2 point mounted SnowBear Winter Wolf snowplow with a single front mount trailer hitch receiver. We will not only match but beat any competitor price on the same item in stock. I've linked the page to our lowest price pledge for you. To use SnowBear snowplow # SB324-167 you will need to use custom brackets # SB397-111 on your 2012 Chevy Silverado 2500. What I recommend is to use a front mount hitch model, # SB324-172, with front hitch # C31023. This way the overall cost will be lower and you get the same plow and a front hitch that can be used for other accessories such as a winch should the need arise. Everything needed for installation will be included.